As our website landing page pridefully says, it’s not just what we build that makes us who we are; it’s how we build it too. Besides being known for our top notch quality and our expertise, we’re also known for building not only lasting buildings but lasting relationships as well. When we were reflecting on some of our strongest relationships, we landed on our sustaining partnership with St. Martin’s Episcopal School. Our relationship began in 2012 when we built their middle school. At the time and still today, it is a premier example of interactive 21st century learning. 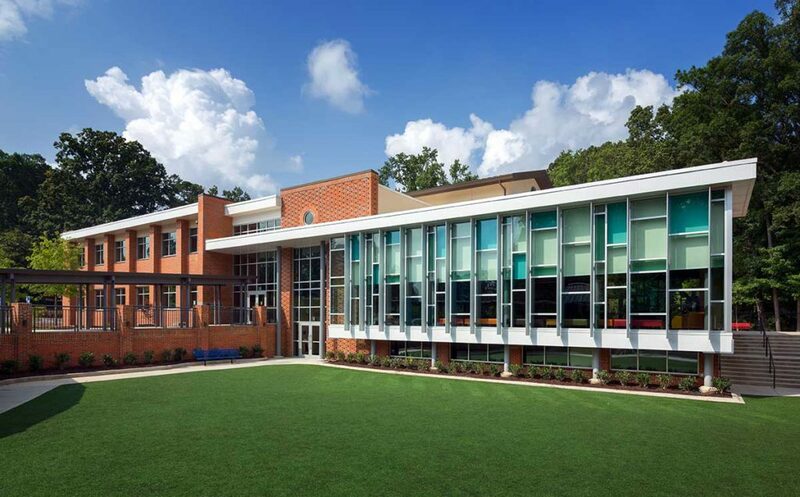 Our original team provided strategic budget management to fulfill “wish list” items while incorporating trends like floor to ceiling folding glass doors which allowed full immersion into experiments and ultimately created indoor/outdoor science labs. However on July 4, 2017 an arsonist broke into the school and set fire to Claiborne Hall, the home of St. Martin’s beginner and pre-k programs. Needless to say, while no one was injured, it was a devastating loss. The St. Martin’s community immediately jumped to action. The church provided temporary classroom space, so there were no lost days of education, and they contacted our middle school building team to help them assess and decide next steps. With Collins Cooper Carusi as our innovative architects, we looked at the different options for recovery. Every avenue for rebuilding was visited. We toyed with completing a quick touch-up of existing conditions and also considered a bigger wish list: a large building with the latest in technology. Through each idea, we provided the school the support they needed to evaluate their options including pricing and timelines. Ultimately the decision was made to rebuild bigger and better. Using the existing footprint, we added a second story to accommodate their growth and needs.